Midtown hostel guarantee for free:breakfast tea & coffe, fast internet access, maps and city guidebooks in your language!!! 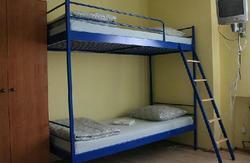 Looking for a nice hostel in Gdansk? One that will be comfortable, safe, fun and close to the city centre? Well, look no further! We offer beds in dorms and apartments at good prices, with continental breakfast included. Free coffee and tea, free wifi. 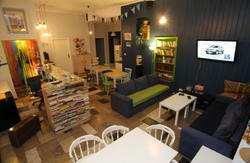 Common area equipped with comfy sofas, TV, movies, books and games. Staff which is always there, and always ready to help. - as well communicated as it gets. Just across the street from the historical centre of the city, which becomes party centre at night. Five minutes from Gdansk Central station, which offers buses, trams and trains that will take You to just about anywhere You'll want in Gdansk and places nearby. - brand new. It just opened at the beginning of this year. And everybody loved it so far. - cozy and clean. We guarantee clean beds, bathroom and kitchen. Noticed something off? Let the stuff know, they'll deal with it immediately. We have 'no mess' policy at our hostel. - safe. There's always someone at a reception. And at night two doors guard our guests privacy. Also - every guest gets his own private stash and a key to it. To use. Earplugs, towels and flip-flops. If you are coming from the airport, take the transfer bus Number 210. From central rail/bus station, we are only 5 minutes walk.